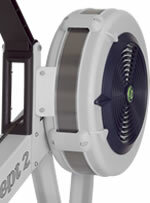 The Performance Monitor is what sets Concept2 Indoor Rowers apart from other training devices, and every Model E includes our most advanced monitor, the PM5. Sophisticated yet easy to use, the PM5 provides accurate, comparable data for every row. A backlight increases visibility, compatibility with USB flash drives makes storing your workout data a breeze, and you can wirelessly monitor your heart rate. The adjustable monitor arm on the Model D lets you position the monitor where you prefer. The Model E features a quick release, frame lock mechanism, so you can easily separate the machine into two pieces for storage. Caster wheels on the front foot allow you to roll the fully-assembled machine into position. These machines are well-known for their durability and construction. Tough and built to last, our machines withstand rigorous use in boat houses, training centers, living rooms, hotels, health clubs and military bases around the world. Theyare easy to care for so you can focus on using your investment, not maintaining it.